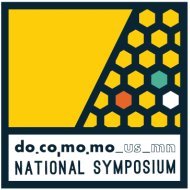 In June 2015, Docomomo US and Docomomo US/Minnesota launched the third annual Docomomo US National Symposium–Modernism on the Prairie: Rural to Metro Regional Interpretations of the Modern Movement. The three-and-a-half-day symposium sought to celebrate and bring national attention to the unique cultural heritage, preservation, and advocacy of significant modern architecture and landscape architecture throughout the state of Minnesota. The symposium included a multifaceted schedule of events featuring: peer-reviewed presentations, panel discussions, exclusive tours, and networking events. As the only national event working to explore and build consensus on the preservation of Modernism, the symposium brought together world renowned designers, scholars, students, and professionals from the state of Minnesota and from around the country. S00_DOCOMOMO SYMPOSIUM WELCOME from Amy Meller on Vimeo. To learn more about the 2015 Symposium and access materials presented during the event, please visit our archive.